wearing a Dirndl or Lederhosen! -One good place to go is this site on about.com. It really is a free, basic German course, but there are a lot of text ads along the way. There’s not many pictures, either. One good thing about the site is that you can listen to any of the highlighted phrases just by clicking on them. -A second option is actually the BBC’s German learning site. It’s got quite a lot in English, but it’s a good way to move into German bit by bit. -Finally, Deutsche Welle (which means “German Wave”) is a famous international broadcaster based out of Germany. It has some basic German courses you can use online. Here’s an “audio trainer” course with the instructions in Spanish (you can also find instructions in English or German). -There are many, many internet sites about Germany, the German language, and the German people, but two that seem pretty good are Germany.info and Young Germany. The first page is from the German embassy in the U.S. so it’s in English. If you prefer Spanish you can go to the German Embassy in Costa Rica’s page. -If you want more information about tourism in Germany, check out this site. -If you want to know more about “Die Schweiz,” then try Swiss World or about.ch. 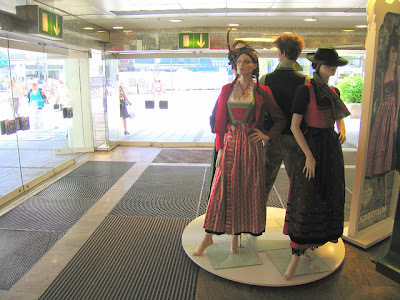 -If you prefer to learn about “Österreich,” head to this page for general information or this page for tourist info. -If you want to learn about Liechtenstein, that small country we mentioned in class, check here. A lot of the information on those pages is available in English, German, and sometimes also Spanish. -The dictionary I mentioned in class is LEO. They also have apps for smartphones, but it’s probably easiest to get them by searching through your phone’s store (like the Apple App Store or the Android Market). -If you want to add the possibility to easily type German letters on your keyboard, there are directions here. Just so you know, your keyboard will obviously look the same, but if you normally have an American English keyboard layout, the Ä key is the apostrophe (‘) key, the Ö key is the semi-colon (;) key, the Ü key is the left bracket ([) key, and the ß is the dash (-) key. If you have a Spanish keyboard layout, Ä is the accent key, Ö is the Ñ key, Ü is the weird downward accent key (`), and ß is the apostrophe (‘) key. That sounds pretty confusing, but if you set up Windows to change between languages, it’s really fast and easy once you get used to it (just click “Left Alt + Shift” to change languages in almost any program, including Word and web browsers like Firefox or Chrome). -If you want to practice the alphabet, check out this site for pronunciation and this site for pronunciation plus a few songs. Here are the numbers if you want to practice them. -Two of the most popular news magazines in Germany are Spiegel and Stern. Both are obviously in German, so they may be difficult if you’re just beginning, but at least they have nice pictures and you can see how some world news is reported in Germany (it’s also a good chance to notice many German-English cognates when reading headlines). –Deutsche Welle has a news page in Spanish (and many other languages… just use the drop-down menu at the top right to select the language you want). -Additionally, Spiegel has a good English site. It’s good if you’re looking for more English practice! SO! That’s a LOT of links. I’m sure that if you want to practice German, you’ll be able to keep busy at least until next week. If any of the links are good, bad, or don’t work, please tell me. Also feel free to mention any other links that you may know of, so that I can share them with the rest of the class.